Regattas are enormously complicated from a logistical standpoint. We need to load a 60 foot trailer with large and heavy boats, transport 60+ rowers to the race course, and feed them all day. Coaches are responsible for getting boats on and off the water. Parent volunteers are responsible for getting rowers to and from the race course and keeping them fed. A few days before each race, you should expect an email from your team's coaches with race information and another email from the regatta committee with logistical information and asking for volunteers. Some jobs involve setting up the tent or serving food at the regatta, others are based in Ithaca and can be accomplished on your own time. We need all parents to help. The expectation is for parents to volunteer at a minimum of two regattas. The coaches will send an email with boat lineups and race times the day before the race. For most races, all information is available at regattacentral.com with the exception of NY State Scholastic Championships and Head of the Fish. Information about those races is available on their websites. Often, boat lineups are not decided until a day or two before the race. Coaches try to make the fastest boats possible. Boats are decided by erg scores, attendance, seat racing, and how well rowers row together. Sometimes the fastest rower is not on the fastest boat due to rowing dynamics. Be sure that you know which boat your child will be racing in so you can cheer! Make sure that your rower gets enough sleep. Ensure that your athlete eats a nutritionally balanced diet. Foods rich in complex carbohydrates and a mix of lean proteins fuel your endurance athlete’s highest performance. Rowers should eat a small meal at least an hour before practices and regattas. Typical light breakfasts for a rower includes yogurt - particularly whole milk yogurt, protein bars, bagels, and cheese. Greasy food and protein (breakfast burritos, eggs, etc.) are hard to digest and will not help your rower compete. For optimal muscle and energy recovery, have your rower eat something with protein thirty minutes after a workout or race. Many coaches consider chocolate milk the perfect recovery drink. Make sure that your athlete stays properly hydrated. Always take a water bottle to practices and regattas. Always check the weather so that your athlete is aware of rowing conditions. Be prepared for the regatta site or the boathouse to be much colder than it is at home. Rowers are out on the water in all conditions, so make sure that your rower comes adequately prepared. In cold weather during the late fall and early spring, rowers should wear a warm hat, a water-/wind-proof/resistant outer layer, and inner layers that wick moisture away from the body (spandex, acrylic, not cotton). It is better for rowers to wear multiple, thin layers instead of one thick layer. Coxswains may need extra layers to protect them from the cold. Make sure your rower has the proper gear for regattas. This may include, depending on the time of year: a water bottle, snacks/small meal for the bus (especially if leaving early in the morning), extra clothes, sneakers, rain gear (especially rain boots), sunscreen, sunglasses, and their uniform. Regatta uniforms (“unis” for varsity rowers, jerseys for novices) are required and will be available before the start of the regatta. Rowers are usually at regattas for the entire day and the weather can easily change, so be prepared for a variety of different conditions. If your child is dedicated to rowing, consider purchasing additional rowing specific clothes, for example: Poggies are similar to mittens and keep hands warm. A rowing vest is specially designed to keep rowers warm in cold weather, but keep them from being hot once they begin to sweat. Learn more about rowing. As an old and traditional sport, rowing has a lot of jargon. Conversations are enhanced by understanding the words and phrases, for instance, knowing the difference between a head race and a sprint, what a crab is, and what the different seats on the boat mean can help you understand your rower's sport. Rowing is an intense, endurance sport. Unlike baseball or many other team sports, rowers train for months, but race only a few times per season. Weather and racing conditions can impact race times and outcomes. Here's where parents can help. When you cheer, they can hear you. Your cheers tell rowers they are almost there and help them find energy for their sprint to the finish. Your cheers make a difference. Parents are required to volunteer at two regattas per season. But, we hope you will come to cheer for the team even if you can't stay and volunteer. Consider volunteering because it helps the team and helps you understand your child's sport. Consider attending regattas, even if you aren't volunteering, because it makes a difference to the team and to your teenage rower. We hope to see you there with cowbells clanking, and cheering, "GO CBC!" 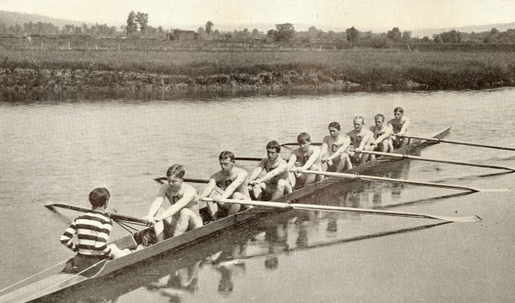 Rowing has a long history in Ithaca. Cornell's first team was established in 1873, eight years after the university's founding. Historically, regattas drew massive crowds to watch. CBC shares the Inlet with nationally ranked crews from Cornell University and Ithaca College. Collegiate crews can be seen practicing during the fall and spring seasons in the late afternoons and early mornings.